Cabin near Mountain Fork River & Broken Bow Lake! Leave the bustle of the big city behind as you relax at this 3-bedroom, 2-bathroom vacation rental cabin that sleeps up to 8 in Broken Bow! This cozy abode is perfect for those who want to get off-the-grid without giving up the comforts and amenities of home - flat-screen TVs and internet access included. Spend your days canoeing down the Mountain Fork River or venturing out onto Broken Bow Lake, rest assured knowing a peaceful respite awaits at the end of each busy day! Nestled near Mountain Fork River and surrounded by pines, this home provides a tranquil atmosphere, both inside and out. Enjoy leisurely strolls around the vibrant backyard, or simply kick back and relax inside 1,200 square feet of living space - where wood beams and high ceilings exude a warm, cabin-like atmosphere. After a day on Mountain Fork River, retreat inside for an afternoon off your feet. Unwind with your favorite shows on one of the 4 flat-screen cable TVs, while the kiddos refuel with an afternoon treat at the adjacent breakfast bar. When hunger grows, whip up a feast for the whole family. The kitchen is fully equipped with stainless steel appliances to assist with any hearty meal. Utilize the charcoal grill on the back porch to perfect your classic Southern dish! When all is prepped and ready, enjoy good food with great company at the 4-person dining table. End the night on a sweet note with s'mores by the outdoor fire pit as a canopy of stars shines above. When you're ready to retire inside, 3 bedrooms await, each boasting soft linens atop a plush queen-sized bed. You won't have to travel far to find some local fun; Mountain Fork River is only 2 miles down the road! Per local tradition, the river is best enjoyed by canoe or kayak to make for perfect family outings or solo trips all the same. You're just a short 20-minute drive from the beautiful Beavers Bend State Park! This forest offers miles of hiking trails to whisk you away on outdoor adventures. Be sure to visit some of the local favorites including Deer Crossing Trail, Cedar Bluff Nature Trail, and Beaver Lodge Nature Trail. Beavers Bend State Park is also home to Broken Bow Lake, where 14,000 acres of water awaits! Enjoy sunbathing and swimming in the cold mountain wake, or become the captain of your own adventure and rent a motorboat from Bandits ATV & Boat Rentals! - Amenities include a fully equipped kitchen, free WiFi, 4 flat-screen cable TVs, in-unit laundry machines, central air conditioning and heating, charcoal grill, fire pit (firewood provided), ample parking space, and much more! 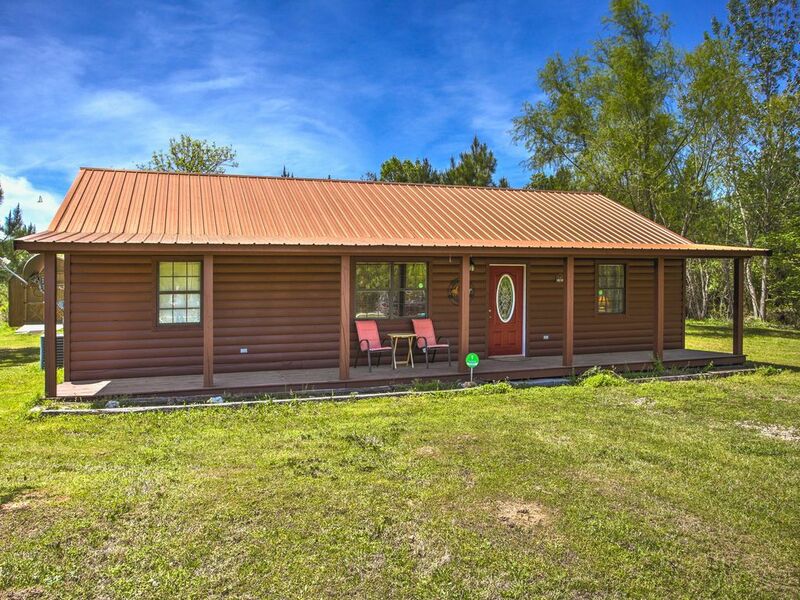 - Beautiful Broken Bow location - Sitting just 2 miles from Mountain Fork River, with Beavers Bend State Park and Broken Bow Lake only 20 minutes away! The cabin was adequate but we felt overpriced for what we got. The cabin was all right and clean. Kitchen was well furnished with everything needed, The tv was difficult to access. The master bed was too high off the ground for my short legs. Master bath shower liner has black mold on it. The cabin was great. Plenty of room to spread out, but yet very cozy. It's off the beaten path, but that made it perfect. Within easy driving distance of town and Beaver's Bend. There are neighbors, but you don't see or hear them. The only minor hiccup was a mix up on our check in date. But a quick email resolved that very quickly and we very much enjoyed the rest of our stay. Was a great place to stay. Clean, modern, roomy and close to the park. My two childhood buddies and myself stayed here for a Girls Weekend. We loved the cabin. It was down a curvy road and somewhat in the country. We had neighbors but they weren’t close enough to be a bother but close enough to be a comfort. The cabin has a security system which was nice and the cooling system was fantastic. The interior was real rustic cabin which gave us the feel of being in the mountains! It was spacious and the beds were comfortable. We had all we needed in the kitchen. We only cooked breakfast but had all we needed. There was a washer and dryer with laundry soap if we had needed to wash any clothes. TVs in every room. Showers were nice and great water pressure. We spent a good deal of time on the covered back deck and had a semi wild cat that we fed. She quickly became a good friend of ours. It is close to all the area attractions. We had a super time. We will certainly be back and will recommend this cabin to our friends and family.